I love his look. So hip bohemian. I’m really not a fan of those ASOS shorts…but I’m loving her cat skirt! I love the wild mix of colors and patterns especially on the guy! Her shoes and bag are wonderful together. Oh, and the background pulls all the wildness together! Great photos! Love this and in particular because they both look like they are having a good fun time as well as looking cool! The last capture is so endearing. The way they both styled the myriad of prints is genius. And totally swooning over that feline print skirt. Their outfits look great together! i hate giving people the satisfaction of labeling them “cool”. but, seriously, look at them ! At first I didn’t recognize it was printed with cats, but then I looked again and saw the cats…And her Melissa Lady Dragon gives the perfect amount of fresh color to the outifit! what a briliantly dressed couple! love her tattoos on the back of her legs and also love her blouse and her vievenne westwood heels! I love your shots of couples. This one is so different from the previous one, she looks shy and tentative too, but a little awkward as well. I like her outfit, stripes with floral. Hard to pull off. Love the pictures! she looks lovely! The hats look fantastically fun! Thanks for bringing a glimpse of Paris to Norway. on a otherwise cold and grey Monday. I love this series of posts. The colorful background gazeebo really adds to the unique prints and color in the couple’s outfits. Rather than a photo with two very interesting subjects, you chose to focus on the individuals as well. Although I tend to lean towards the more classic attire, I find the fun and edgy look very appealing and stimulating! Thank you Scott, you never fail to excite the eye or imagination! Is still summer in Paris? Wow. Just… wow. So imperfectly perfect, both of them. One of my favorite photos of my mother was taken in this same spot. Perfect! And I just love her shoes. Interesting tattoos and mixing of prints. Quelle belle serie! They are merveilleux, singly and together. Beautiful photos, very inspiring. I’d have a drink with these two. super eclectic, not something you normally see on the streets of Paris, LOVE it. LikeLikeLike. Cute! Love the pattern-mix! J’adore! Ils sont trop mignons ensemble! They’re a fun couple. Love the colours. Those ones are also very cool, but I am not into tatoo’s so much. I love her bag and his shirt and the way they combine them with the rest items they wear as well as with each other. Nice pics, really nice. You seem to capture light in your own special way and I love it. Great couple. The girl is stunning. Her look is so bohemian and laid back, I love it! Her hat is very cute, and I like the color palette she used for the entire outfit. He on the other hand just looks a little too laid back. Super Original and unique! honest too! WHERE OH WHERE can i get this skirt?!!! Someone please help! i wish i was tiny enough to pull this off. i love whimsy and bohemian styles. this was a beautiful mash up of the two. oh so cute and stylish! I’m imagining this couple looking at each other first thing in the morning and saying, “Let’s look amazing today, shall we?” Love this quirky style. Very imaginative and sweet. I love her cat skirt! I would love to wear her cat skirt! And I love the robin egg blue shoes. It is good to see couples dress in a sympathy to each other. Its like they have a little secret world of their own, even if its just the size of a closet, its still good. They seem like a couple I would want to hang out with. Everything about these photos is gorgeous. Something so ordinary human interaction can be so beautiful and sweet. I so enjoy this photo of a wonderful and fantastic couple.. I don’t know what I love more, the funky shoes or cat skirt?! I am loving the playful cat trend that I have been seeing lately. I’m loving all these couple pictures. How cute are they! Love the at skirt. Just fun fun fun. Great outfits for showing off their tattoos too! Great mix of prints, and love her tattoo on the back of the legs! Wow! I love their look!! dying for the color matches!! what an amazing looking couple! Her tattoo’s are so original and amazing! Love her bag and cat print skirt! His look is so cool. I really like his shorts . very original couple! I their style! I’m enjoying their enjoyment of their looks & each other. And those back-of-the-thigh tattoos look pretty fabulous. Now that is one colorful outfit on the guy. Love that you captured him in front of the colorful background too! Nice couple this too. Love the purse and the style of her! I love the couples series. It’s so peculiar to see how couples tend to dress alike after some time together. They influence each others style consciously or subconsciously. But it’s always nice to find the differences in the way they dress, probably reflecting the differences in their personalities. That girl rocks. I love the skirt, is amazing. And the shoes are perfect. I really enjoy these couples photos. This pair looks like they have fun playing dress up maybe a little too close to silly. You couldn’t have caught those two in a more perfect location!!! I love her style and the consistency of her tattoos! i like how they do! after seeing them paired, the shots of them individually, they look incomplete. they’re probably both really fun and bright individuals. i love people like this! go win! Not really my style, but they do look cute together. Definately a couple that stands out ! one word – WOW !! As the pictures downloaded I was half-expecting this couple to be standing in a pile of sand on the beach! Could they be any more hip? This is like a European version of Fruits, especially the first image. I like it. Incredible combination of personalities, each one conveys something and together something different, such as combining blue and yellow, get green. By the way Metro station is great … but do not see it integrated into the picture. really LOVE when you do the Couple-photoes! keep doing mor of them! love whem you first put them next to each-other, more seriouse, and then separate them like this, so you se thier personal style, and then reunite them in a more sensitive photo… either way, keep doing moore of the couple-thing! Love the skirt in the girl! These two are FABULOUS, I absolutely love their spunky outgoing style! The tattoos on the back of the legs very eclectic.. They both have such colorful looks. I love it! LOVE the VW Melissa shoes ! They are lovely! The portarit of Love! This is truly the last straw!! Your subjects were always edgy, cool, stylish, and truly inspiring; however, this is foolishness!! Lately, you have been heading down this road and I thought it was a “phase”. I was wrong. I do not have time to waste on such nonsense. i love your photos, but not the dresses of these persons! Anytime you combine red (her bag) with that particular shade of blue (her shoes,) I am happy. Like vintage Christmas colors. Adorable! This! This is ART! Contemporary Art. oh my I cant get over that shirt and the shoes and … arg I love it all! This picture screams inspired individuality. I love the tattoos on the back of the woman’s legs. That is audacious and fantastic. She is really stylish and the man is pushing the boundaries, in a great way. They are so cool!!! love this picture well spotted !!! Uauuuuuuuuuu que orgulho, melissa nos pés, produto totalmente brasileiro!!!! LOVE the mixing of patterns & prints. This duo has it going on! love the tattoo on her knee!!! Effortless and Beautiful. I love this couple. Cute and quirky. This girl is giving me Molly Ringwald back in the day big time. ALL STYLES, not just ONE style! I really kind of like this. A couple of people who aren’t afraid to dress how they want without caring what other people think. Summer fun but im not a big fan! I love the label sticking out of her shirt. It looks like she picked her clothes up off the floor. She has great style. Thanks for posting a series of this couple. Ugh. I’ve fallen head-to-toe in love with this couple. Bizarre and Over the Top, some people might think these two people look, they are REALLY masters of Pattern Mixing and working a Color from head to toe. Set against the colorful background in photo 1, they fit into the environment perfectly! What an incredibly cute couple. Really digging those mad prints and the way they’ve put them together – ingenious! Too adorable for words, really. Hope to see more photos of these two in the near future! This is the kind of style that you hate or you love, no mixed point of views. They really merit because it is not easy these days to be original, almost everything have been tried!! loving the mixing of colors and the cool placement of tattoos! C’est BOOM! Really love these two. The guy’s shirt is from Aurélien Arbet and Jérémie Egry’s Hixsept line (www.hixsept.com)… they do some really terrific work spanning all sorts of mediums. Great to see it on the street. I love how their personalities change depending on whether they’re together or apart. Brilliant how you can capture that! love this boho couple… so adorable, the tattoo on her leg just makes it perfection. Well, even though you’re not reading this, I’m compelled to say: “edgy, cool and stylish” does not preclude love. In fact, love creates “edgy, cool and stylish”. Oh Mon Dieu this looks like a children’s painting with all the colors. i am in love! Even though the clothing is very eclectic and quirky, I couldn’t help but notice how well the girl works proportions to flatter her body type. I usually don’t think much of such things, but the slight high waist, length of skirt and the mid heel make the most of her legs, while the button up shirt keeps it from going too bare. Very graceful. I love her red bag!! stunning! her tattoos are so wonderful! i’ve never seen one around the kneecap like that. very cool. these are the kinds of people i like to see! genuinely interesting and unique without taking themselves too seriously. LOVE LOVE LOVE those shoes!!! My neighbour’s using the exact same red bag I wonder where it’s from? How bright! I love her skirt with cats! Nicely put, sir; nicely put indeed. I cannot even express how much I love every single thing about these shots. Oh my. Fabulous! I can just imagine their apartment! So good to see the brand Hixsept in the streets of Paris ! Love them. I don’t know what that colorful structure is behind them, but it makes the shot. They look like fashion candy. She has great tattoos, and I love his shirt. I love love when you shoot a couple. They are so perfect. original, beautiful and fun! i love! A singular couple, a little bit over the top but they are free to be! Fun and flirty bohemian style–love them!! Even the label sticking out seems to fit–why, I don’t know as this is a pet hate of mine! Stylish ! They look so amazing. I am fascinated by this couple. Oh, I just love how colorful and nice they look! aawww, schucks…Scott deserves all the credit. Merci, anyway. 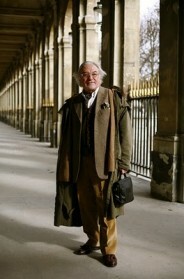 My new favourite Sartorialist series. Simply endearing! however, i d like to know how to get them in cyan just like in the pic! Am I smelling a wonderful new COUPLES series here?!?!?! I love it thus far. All 3 couples have been styled to perfection. This couple is my favorite. The outfits, the pose, the colorful background make this picture so unique. The guy kinda looks like Marc Jacobs no? Great job. I do NOT like tattoos but the one on her knee has the greatest placement. This is probably the best post ever! I love the style of both and her tattoo. Great shots. Wow, just wow! They’re both so interesting! I wish I knew what her tattoos said, so intriguing! I do hope that’s a tattoo of her shirt label on the back of her neck – not a label-crime!! It’s amazing how they do not match at all and yet seem to match perfectly. A perfect mismatch perhaps? haha, very witty, these two! I adore the gentlemen’s outfit, and the lady’s mint shoes are very cute. Their tattoos add so much more to the art of dressing up. Her outfit is completely flawless – amazing!! Not a huge fan of the tattoos as they seem almost like afterthoughts. To each their own I suppose. Linda a saia de gatos!!! This makes me want to run out to get some ink near my knees. Even when I know how insanely painful they will be! Thanks everyboy for all compliments, my boyfriend and I are really really affected…..!!!!!!! By the way my skirt is a Topshop and tattoos on my legs are the dates of birth of my lovely grandparents. ID on the mens shirt? I love these two. The patterns are wonderful. I love the cat skirt. Just the reason why I want to live in Paris again one day. Went to college there and think about life there every week. The girl’s outfit is just magical and the red bag just make it. The guy is cute and fun too. Love the colors and the mood. I love her tattoos! The knee is such an overlooked place for tattooing. Apart from the couple’s style, what is also interesting is the guy’s resemblance to Marc Jacobs in a way. His shoes are dope. I can’t get on board with his headwear, however. People like this make me happy I visit Asia regularly. I used to live in Europa. Love this post! What an amazing couple :D And both such a great an unique style. This just made my day! looks like people you would see at newtown, love! His shirt is everything. Does anyone know the source? Hey Kevin, the shirt i’m wearing is Hixsept L’oiseau Gris. To Yoan and Katy, all I have to say is well done! Hey Yoan, you told us where the shirts’s from (and it happens to be sold out as well), but where are your shorts from? sweetness me! Where ever did she get those shoes? The lines are simple and fluid. The color is amazing! I need these shoes! Anyone recognize them from anywhere? she has a style. but she is missing very important delicacy for the styling. neck tag is out. when I saw it. I lost all my good compliments in her style. 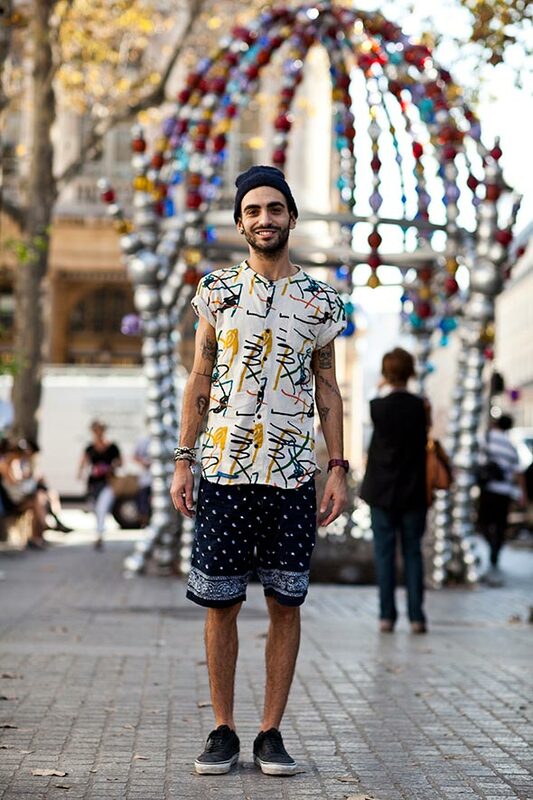 this is just too good, definitely my fave street style photos in a long time!. thumbs up, you guys! Me gusta la gente sencilla pero muy original, que no va a la moda, sino lo que siente en ese momento, genial las fotos, pero los chicos mas. Gracias. What a fun couple. They compliment each other very well while being their own person. They found a way to harmonize their looks with pieces made for independent style.